"God is gonna have His new order literally, they gonna inherit the earth and God will give them that platform, except He's goin' to endorse them with signs and wonders and wisdom. God's raising up mature sons and daughters that will really inherit the earth with wisdom and affect the entire order of society in the future, in government, in politics, and billions of dollars of finances...."
Dominionist leader C. Peter Wagner's name has suddenly been pulled from the list of endorsers for Texas Governor Rick Perry's controversial The Response prayer rally scheduled for August 6th (see the previous four Herescope posts). The Response website has changed continually since the first controversy first broke, and there has been lots of spin and damage control going on. The original "Endorsers" webpage remained up for a period of time, even though it wasn't linked to from the main webpage. Finally it was pulled entirely and a new webpage "Honorary Co-Chairs" has been posted, which includes the list of "Endorsers," sans Wagner. But Cindy Jacobs is still on the list. Why all the fuss about a governor sponsoring a prayer event? Because Rick Perry is a potential candidate for president, and his endorsers, leaders and co-chairs include high-profile members of the IHOP movement (Kansas City "prophets" group) and C. Peter Wagner's 7 Mountains Dominionist network, the New Apostolic Reformation. The issue here is not prayer per se. The issue is what kind of prayer and its purpose. Many governors and political leaders over the years have had all sorts of prayer breakfasts and events -- typically they are sappy ecumenical affairs that provide politicians and an opportunity to act "religious" for votes. But The Response prayer rally is different because of the personnel involved. The leadership includes people who have a significant and controversial agenda: building a kingdom under the guise of American patriotism. This type of prayer is not about evangelism. It is about Dominionism. This movement has been going on for decades now, but it gained momentum and popularity under the auspices of C. Peter Wagner, who first articulated this agenda in numerous books on the topic. Wagner, formerly a professor at Fuller Theological Seminary, began to experiment with novel forms of worship, including prayer, in the 1980s. Wagner says that his idea about prayer began to change when he was exposed to Paul Cain in 1988 and Cindy Jacobs in 1989. Paul Cain was a father figure in the "Kansas City Prophets" which formed the IHOP (International House of Prayer) movement. Cindy Jacobs has since become one of Wagner's chief lieutenants in the global Dominion movement, particularly through the vehicle of prayer. Spiritual warfare teachings and methods became very effective at supplanting the Gospel of salvation. The basic sinful nature of man was no longer the issue. Suddenly there was a new enemy -- outside! An enemy so fierce and unrelenting that it must be continually bound, cast down, overthrown, and warred against. A dreadful demonic enemy that was railing at the gates and threatening to break down cities to steal your children, let homosexuals loose, and destroy America. Prayer warfare substituted for the old-fashioned biblical concept of simply sharing of the Gospel to the lost. Huge rallies began to be held, prayer marches, and round-the-clock vigils that claimed to keep Satan and his minions at bay. It became a new way to fight evil. The battle became "us versus them" -- believers versus Satan and his demons. Not the believer resisting sin and evil in his own life. Nope. It became an external battle. And it consumed the precious time and energy of saints, who rather than walking boldly into Athens to share the Gospel of Salvation on Mars Hill, prayer marched around the outskirts of the city and ranted and railed at powers and principalities (never mind that there is no mention of the Apostle Paul ever doing this). The more wailing and railing against demonic powers, the more Dominion could be had. The IHOP movement was formed with this belief, combining prayer warfare with an extreme worship style. The Kansas City group wrote in Fall of 1989 that "we believe that this holy, believing, persevering prayer is our most important job as we seek to cooperate with the Lord in bringing His Kingdom forth.... the saints have been asking the Lord to release a House of Prayer where intercessory prayer and anointed worship can ascend to God's throne 24 hours of every day." In the case of the Kansas City group, this worship/warfare prayer mix became a consciousness-altering activity which produced intoxicating spiritual experiences. Other groups all over the country began to copy this style, facilitated by C. Peter Wagner and his widespread advocacy and marketing of this agenda. One of the most obvious Dominionist agendas of the prayer movement was the idea of "claiming territories" for God. C. Peter Wagner expanded upon this idea when he assigned territories and "spheres" to his apostles in his New Apostolic Reformation. Prayer warfare by marching through regions and areas became a way to spiritually practice real Dominionism. This then led to "geographical" claims that there were mountains, portals and other specific areas of the earth that needed to be mapped out, marched upon, prayed over, decreed about, and cleansed and rid of demonic elements before Dominion could be established. Church Growth ideas became the catalyst for the technique-driven methodologies of seeker sensitive churches employing marketing and managerial paradigms so popular in the mega church movement. In turn, Wagner took the pragmatic concepts of church growth thinking a step further and applied them to the spirit world. He took the same pragmatic perception but removed the battle from earth to the heavenlies in what he calls Strategic Level Spiritual Warfare (SLSW), his name for battling territorial spirits. Unknowingly, borrowing from Latter Rain concepts, he saw church growth as dependent on defeating territorial spiritual rulers. The way to make a church grow is not primarily appealing to the felt needs of the people but rather in devising a pragmatic strategy to defeat territorial spirit powers. If these entities can be destroyed or neutralized, the church growth we all desire will be assured. In fact, old fashioned preaching will hardly be necessary once the hindering spirits have been vanquished. Rather than doing market surveys (a la George Barna), church growth, for Wagner, depends on mapping the spirit world, discovering what territorial spirits are in charge of any given locality and then devising spiritual technologies and practices which will render them ineffective in keeping people groups from responding to the Gospel. Spiritual warfare then is pursued as the first step of any evangelistic endeavor and the precursor to the great harvest that Church Growth has always promised. Current Warfare Evangelism relies on these same two warfare principles - specific intelligence of the spirit world and new spiritual methodologies which purport to neutralize or destroy enemies in the spirit world. All of this is designed to ensure victory in evangelism and to establish God's Kingdom upon the earth. Spiritual Expeditions for the purpose of dismantling demonic powers, such as the Mt. Everest "Operation Ice Castle"
City-Reaching for the purpose of "transformation"
Pragmatically speaking, one of the dangers of SLSW is that it will deplete the energies of Christians. After all the prayer walks, marches, expeditions and stake driving ad nauseam, the Christian community will hardly have the energy to slog it out in preaching and teaching the Gospel, which Paul said was "the power of God unto salvation" (Romans 1:19) and which Hebrews 12: 4 states is "sharper than any two edged sword." Wagner has had a profound influence on the entire global agenda for prayer, which underwent a massive shift from individual and humble intercession to mass-marketed prayer blitzes and extravaganzas. This agenda implies that God cannot or will not hear unless there are huge outcries, mass rallies, frenzied corporate worship, 24/7 round-the-clock intercession, and scripted calls for Dominion. These massive prayer rallies bear a striking resemblance to mass political rallies, which may be intentional. In 2005, this momentum for global prayer culminated in the first Global Day of Prayer, a huge "global teleconference" that "allows people worldwide to unite in simultaneous prayer." The agenda of this movement was to "Continue to pray and contend for the kingdom of God to be release [sic] & revealed ‘on earth as it is in heaven,'" (note how this phrase in the Lord's Prayer is consistently mis-applied in a Dominionist context). The scripted prayers called for a "kingdom" and "restoration" agenda. The idea behind this event was said to be, "Building a canopy of prayer over all the continents" so that "the glory of the Lord [can] fill the whole earth" to "hasten His coming" and for "Christ's kingdom to change the way cities and nations are governed." Many of the same groups and individuals now endorsing, sponsoring and supporting Governor Rick Perry's The Response prayer rally were also behind last year's May Day event at the Lincoln Memorial. That event was strikingly similar in its calls for political change, its New Apostolic Reformation leadership, and the Christian Right political activist groups backing the event. On Saturday, July 2, our teams and group gathered on the actual battlefield. We chose the High Water Mark, the “breakthrough point” that turned the tide of the battle. On this small hill that bore witness to the most bloodshed in Civil War history, we divorced Baal. And this is precisely the point. This group of prayer warriors also thinks they are Joel's Army, taking up an endtime battle to restore the earth to Christ so that he can return with "his kingdom" which they will govern. Why this unbiblical agenda has become part of American patriotism and enmeshed with concern over immorality in our nation is the question of the hour. Obviously, these prayer events in combination with frenzied political action are replacing the Gospel of Salvation, which alone has the power to minister life and healing to people who live in sinful lifestyles. Furthermore, one can read through the reports cited in footnote 16 and 17 above and search hard to find any mention of the Gospel of Salvation, the cross of Jesus Christ and His shed blood for our sins, and the necessity of repentance. Oh, there's a lot of Bible verses -- most of them taken wildly out of context and misapplied in some odd ways. But who got saved along these journeys? Anyone? Perhaps this indicates that these prayer routes were not intended to bring converts, but rather establish governing rights for their "kingdom" here in America. A terrible thought. So why is a Texas governor, who is seriously considering a run for president, hanging out with these amazingly bizarre, self-anointed, self-appointed, false apostles and prophets who want to rule the world? 1. Mike Bickle, "The Fact in the New Order in God's Work," October 26, 1986, transcript page 25, quoted in Ernie Gruen's report "Documentation of The Aberrant Practices and Teachings of Kansas City Fellowship (Grace Ministries)," http://www.deceptionbytes.com/AberrentPractices.pdf. 2. Sarah Leslie, "The Global Day of Prayer," Discernment Newsletter, May/June 2005, http://www.discernment-ministries.org/Newsletters/NL2005MayJun.pdf For more history see "Praying in an Emerging New Order,"
5. C. Peter Wagner, Churches That Pray: How prayer can help revitalize your congregation and break down the walls between the church and community (Regal Books, 1993). Recounted on pp. 72-73. 6. There was a "Special Prophetic Edition" of the Grace City Report, which was a "monthly newsletter for the six congregations of Kansas City Fellowship," dated Fall 1989, which contains many key articles about this group's history and mission. Noel Alexander wrote an article "Intercessory Prayer: Kansas City Fellowship's Theology, History and Practice" (pages 15, 17) which outlines the background of what has become the IHOP movement. 8. See "Three Fallacies Of Third Wave Spiritual Warfare Teachings," Sandy Simpson, 10/19/05, http://www.deceptioninthechurch.com/threefallacies.html for some wild examples. "The best of every blood line"
"300,000 that will have a special measure of the Spirit"
"getting the next generation into the warfare"
The IHOP (International House of Prayer) movement is now front and center stage as a national controversy continues to swirl around Texas Governor Rick Perry and his upcoming prayer rally The Response featuring prominent IHOP and NAR leaders as "endorsers." The national media is scrambling to catch up with the significance of this event, and a few reporters are bungling it badly. [Alice] Patterson's aim, as she makes clear in her book [Bridging the Racial and Political Divide: How Godly Politics Can Transform a Nation], is getting black and brown evangelicals to vote Republican and support conservative causes. A major emphasis among the New Apostles is racial reconciliation and recruitment of minorities and women. The apostolic prayer networks often perform elaborate ceremonies in which participants dress up in historical garb and repent for racial sins. What do these self-proclaimed apostles and prophets of IHOP and NAR mean when they talk about race and abortion? Do they mean what YOU think they mean? They have a long history of double-speak. You might think they are against abortion, for Israel, and against racism. But are they really? This group is noted for their clever use of language and unique terminology, especially the concoction of new doctrines. Note the terminology in the quotation above: "new breed." And note the reference to "ceremonies" which supposedly repent of "racial sins." These ceremonies are based on a Dominionist teaching called "Identificational Repentance" which puts more focus on ethnicity than language, a strange practice if one is concerned about spreading the Gospel. From their inception these self-proclaimed prophets have articulated what they mean by these terminologies. They claim that they got their teachings from "God." And what they actually believe should give any American truly concerned about race relations, the right to life, pro-Israel and freedom of religion pause for sober concern. Their agenda may be totally different than what appears on the surface. Like any cult, they may seem sincere. But they also have scary ambitions, which are both political and religious, and they fall far outside the American mainstream. And they intend to use the current young generation, what they call the "New Breed," to achieve their political aims. What follows are a series of quotations and excerpts from old Discernment Ministries newsletters. Discernment Ministries began publishing newsletters in May of 1990, chronicling the rise of the Kansas City group in particular. The most important pieces of documentation are the graphic image exhibits that were common during the era when the Kansas City group merged with the Vineyard. Exhibit A at the top of this post is a poster that was for sale from Kansas City Fellowship two decades ago which depicts the "manchild" -- a fair-skinned baby who represents the "New Breed" becoming "god-man." 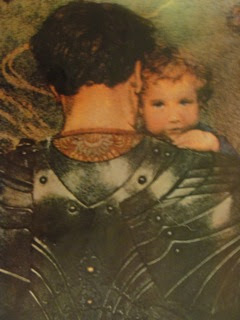 Exhibit B, the military knight in armor holding a blonde-haired, blue-eyed baby, represents the "New Breed" that is to become "Joel's Army." "The children are the best of all the generations that have ever been upon the face of the earth. . . those ELECTED SEEDS that will glorify Christ in the last days. .. they will move into things of the supernatural that no one has ever been in the Bible - They'll move in it consistently. . . they themselves will be that generation that's raised up to put death itself underneath their feet. . . . a church that has reached the full maturity of the god-man!" (Transcripts, Kansas City Fellowship, 1988 Interview Bob Jones with Mike Bickle). This NEW BREED mentality is one of the most dangerous and divisive doctrines facing the Church. It threatens existing denominations and churches across the nation. Pastors, brace yourselves to face growing confusion as a result! Again, it needs to be emphasized that this NEW BREED doctrine is the kernel thought that undergirds most of the known cults. Hitler, in the name of God was religiously obsessed with the idea of a NEW BREED of people, a PURE RACE, a NEW GENERATION and A NEW ORDER. Books and publications have attributed the rise of the Third Reich to the spirit of occultism. Many of the great theologians in Germany at that time gave Hitler's "pure race" ideology theological cohesiveness. Amazingly we are now seeing history repeat itself. However the modern "prophets" interpret their NEW BREED of religion, the fact remains it is the same seed thought (elitism) that gave rise to Hitler's THIRD REICH that plagued Germany and the world. It was this spirit of "elitism" that led to anti-Semitism. Nazism, the New Age Movement and the NEW BREED are one and the same: they are merely different manifestations of the same evil seed - "elitism". The NEW BREED spirit in Hitler's day permeated the churches in Germany. One of the first things the NEW BREEDERS sought to do in support of their "elitist" race was to unite all the churches in Germany. With this NEW WAVE of "elitism" once again flooding the Church, it comes as no surprise to hear the apostate Church speaking of UNITING all the churches at the expense of SOUND DOCTRINE. Furthermore, Discernment Ministries warned back in 1990 about the rise of this "New Order" and explained in the November 1990 Discernment Newsletter that "THE NEW ORDER that is arising is, among other things, a REPLACEMENT for the Nation of Israel." So what is the NAR/IHOP political action alliance agenda? Do we really know? We see the public facade, the Tea Party political rhetoric. But do Americans really understand the depths of bizarre occult ideas that lie barely beneath the surface -- the fervent military heresies that are so powerful and seductive, engaging youth and political activists with the cause to fulfill their calling as a New Breed race, becoming a Joel's Army marching in lockstep, to build a New Order Kingdom on earth? 1. All believers are equal in Christ. Galatians 3:28. 2. All believers are new creatures. II Corinthians 5:17. 3. All believers are made righteous by faith, that is of grace. Romans 4:16. 4. All believers are of the seed of Abraham. Romans 4:16. 5. All believers were baptized into one body. I Corinthians 12:13. 6. All believers are members of the body of Christ. I Corinthians 12:14. 7. All believers are part of the ELECT. I Peter 1:2. 8. All believers are a CHOSEN GENERATION. I Peter 2:1, 2. 9. All believers are "born again." John 3:3, 15. 10. All believers are lively stones and a holy priesthood. I Peter 2:5. The word BREED is not found once in Scripture, much less the term A NEW BREED. 1. Background documentation for understanding these teachings of the Kansas City group is the taped excerpts of a discussion between Mike Bickle and Bob Jones, which is transcribed at this Herescope post, 2/3/06, "The NEW BREED Defined," http://herescope.blogspot.com/2006/02/new-breed-defined.html Note the focus on the New Breed generation. 6. 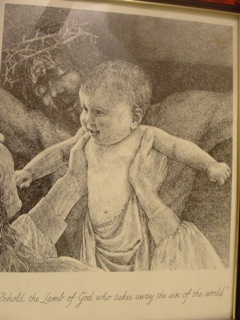 Jewel (van der Merwe) Grewe has spoken extensively on this topic, using these two graphic images of the New Breed babies as exhibits in her speeches at Discernment Ministries conferences over the years. Discernment Ministries has on file the original documentation on this matter. 10. Ibid, quote attributed to Dr. Patricia Morgan, "professor at ORU" (Oral Roberts University). This quotation and the one by Nelson above are included as examples of how these teachings were spreading as early as 1993. 11. Paul Cain, KC "prophet" speaking at the Anaheim Vineyard "School For Prophecy," Session 7, quoted as an example of Manifest Sons of God teaching in the Discernment Newsletter, May/June 1994, http://www.discernment-ministries.org/Newsletters/NL1994MayJun.pdf Cain, Bickle, Bob Jones and others at KCF were said to be the "FIRST FRUITS" of the "NEW BREED" leaders to come (June 1990 Discernment Newsletter). 13. Oct/Nov/Dec 1994 Discernment Ministries Newsletter, http://www.discernment-ministries.org/Newsletters/NL1994OctNovDec.pdf quoting from the Fullness Fellowship Communique, Vol. 3, No. 4, April 1990. Ed. Note: Many of the quotation from this post can also be found in the document by Pastor Ernie Gruen, "Documentation of The Aberrant Practices and Teachings of Kansas City Fellowship (Grace Ministries)," http://www.deceptionbytes.com/AberrentPractices.pdf and many are also transcribed in the book Vengeance Is Ours: The Church In Dominion by Al Dager (Sword 1990). These and many other of the original recordings and pieces of documentation are in the possession of Discernment Ministries.